With humor, personal honesty and sometimes heart pounding prose, Polly takes us along on her journey, delving deep into the pain and witty absurdity of being a woman reveling – and struggling with all that the world has to offer. Narrated by Polly! 2-disk MP3 CD set. Price is $20 + shipping. Book Price is $19.95 + shipping. 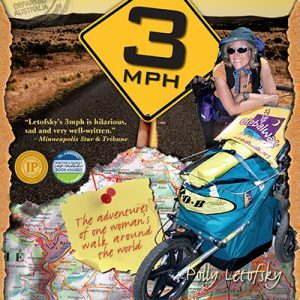 Order 3MPH: The Adventure of One Woman’s Walk Around the World and Polly’s GlobalWalk the documentary for $30 + shipping. 104-minute DVD in HD that follows this heartwarming journey of a lifetime. Price is $20.00 + shipping.